London is an international fashion capital with talented designers, renowned fashion brands, leading technology innovation, and top fashion schools. With the rapidly-developed fashion technology industry zone at the east end, London has developed into a bold and charming global fashion innovation and business center. Featuring “Fashion Entrepreneurship and Innovation Spirit”, Luxe.Co’s “Global Fashion Innovation and Investment Forum 2018” has made its second stop in London, UK. The forum attracted leading entrepreneurs, independent designers, investors, brand executives, and experts and opinion leaders in fashion and lifestyle from both China and the U.K. In-depth discussion was conducted on many issues of fashion entrepreneurship, technology innovation and the prospects for collaboration in the fashion sector. 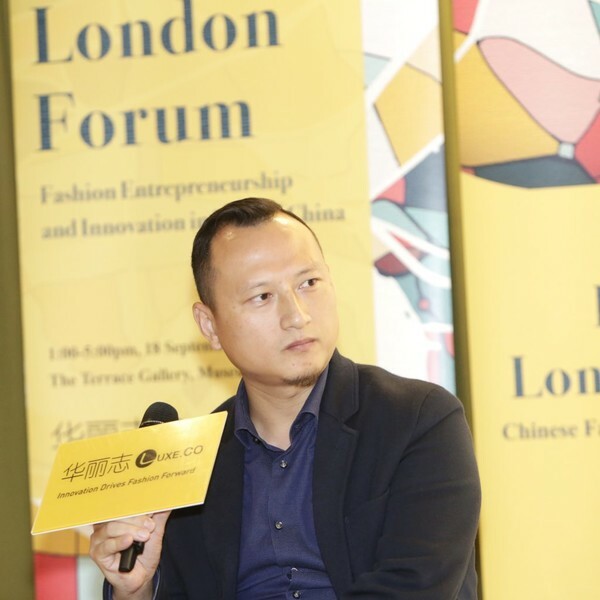 In the second part of the forum, Head of Research of Luxe.Co, Claire Shen discussed with Yan Chen, Managing Director of Fosun Intelligent Retail Group on the empowerment of technology innovation in the fashion industry. Yan Chen is the Managing Director of Fosun Intelligent Retail Group with over 20-year experience in brand management and investment. He was one of the founding members of Sephora China, and is very experienced in brand investment and post-investment operation. Shen: In this dialogue, we will discover how technology empowers the fashion industry. Intelligent retail is not a new concept in China. Many technology giants, such as Tencent and Alibaba, have similar concepts on retail. For Fosun, how do you define intelligent retail? Chen: I am very happy to share what I have experienced from intelligent retail. I do not think there is a definition for intelligent retail. Fosun formed the intelligent retail group recently and our attitude is learning by flying. Ultimately, the core is about retail. It is the interaction between merchant products and costumers. When we talk about intelligent, people will think about fancy technologies. But, we also think about the tools that can empower products, brands and consumers, and make them much smarter and more efficient. The traditional shopping pattern includes brand awareness, engagement, experience, purchase and after-sales. But with technology now, the pattern has changed. Everything is possible at any time. So, we are thinking what technology are most helpful for brands to engage with customers. Shen: You mentioned new tools. Can you give us some examples? Chen: Recently, Fosun has invested in a non-person retail store or convenience store, Bing Box (缤果盒子). It is very interesting. The store is about 5 square meters. They can be located at certain areas where traditional convenient stores cannot go, such as some residential areas and commercial buildings. Technology empowers these stores. They are self-serviced. If you do not download the application, it can be difficult. But once you are used to it, you will find that it is really amazing. Regardless of the location, you can always find what you want inside these stores. Even when all other stores are closed, you can easily find your products in Bing Box. Another example is about kids. When my kid has fever at night, I always check my medicine box at home. There are many medicines, but many of them have already expired. This was my experience. But now you do not need to have any medicine box at home. There is a Bing Box downstairs serving you all the medicines you need. It’s easy. With technology and new retail concept, the problem is solved. These are the examples how technology helps on retail. Shen: From the surface, it is a store without staff. But I think it is more than that. Stores need to collect customer data and understand consumer profile, behavior and preferences. Supply chain also need to support the operation. Could you please elaborate on the technology support? Chen: For intelligent retail, people usually think about the customer side. The other way is from the operators’ side. In retail, especially in China, rental and staff are major costs. With non-person stores, we can help small entrepreneurs in this matter. We also have stores with different sizes to be more efficient in inventory. Technology not only benefits customers, but also benefits operators and everyone in the whole value chain system. Shen: Do you think fashion retail shares the same story? Chen: I think so. I live in Shanghai and have worked in the fashion industry for a decade. The distribution has changed with e-commerce. But I think supply chain has not changed much. There are many intelligent technologies including AI and data analysis to help revert or change the whole chain. Supply chain can be painful in the fashion industry. There are many people working behind as merchandisers and allocators. But there is something happening. I know the system is automatic and much more efficient in China. It is not only about the speed and customer satisfaction, but also about speeding up the value chain and managing selling costs. If you are an entrepreneur, you know that you have to spend money. This is cash flow management. The system can help improve cash flow and be more efficient. This is the fundamental support to the fashion industry. We talk about LBS (location-based services) a lot. There are also technologies, such as in-house Wi-Fi to conduct customer tracking. For example, we have 30 to 50 stores. We try to understand the path of customers, traffic and shopping patterns. Where do they buy? Do they go to one shop or other shops? How close are the shops? Are shops close to offices or home? With data collection over the years, shops can create a huge matrix of customers. Then shops can utilize the data to guide consumer behaviors. This is already happening. Shen: I know you have traveled to many countries and looked at many investment projects around the world. In terms of landscape and the development of technology, how do you compare different countries? Chen: In terms of intelligence, China is advanced in application environment. There are 1.4 billion population in China. Real data has been running day-to-day. Also, China is encouraging entrepreneurship and technology innovation. The technology development in retail and fashion concepts is growing very fast. In Europe, the fundamental of brands is heritage, which is an advantage compared to Chinese brands. In addition to supporting sales, technology innovation in Europe is also empowering the branding and the brand lifestyle. For example, this morning I met a company who is making tires that can generate power. In the US, there are a lot of technology innovation in retail, particularly in the west coast. There are many new concepts coming out, for example D2C (direct to customer). There are also many emerging brands with 50-million-dollar annual sales and many followers who share the same idea. Shen: Let’s discuss from another angle. I remembered that at Orange Bay University we had a case study on the digital strategy of a major retailer in the US. The professor of course is a very experienced entrepreneur in big data, who has many traditional retailer clients. He said that many retailers went to him for big data solutions. But he mentioned that big data was not a fortune teller and it could not solve everything. There are so many talks about AI, AR, VR and etc. There are many new intelligent stores in China with fancy virtual features. However, they did not change much in terms of products and product image. Which area do you think is more mature and is really driving meaningful changes to the industry? Chen: I had the experience operating brands as a General Manager previously. I think we should embrace technology. But I also agree with you. Especially in the fashion industry, not 100% tasks can be made by AI. AI is working with big data, providing statistics on historical data. The decision making is up to people. In terms of management, if the technology can make it more efficient, we should embrace it. There are many technology applications on the merchandising part. For example, we can have real-time performance data now, which is very helpful for store managers. But in the fashion world, we still need people. Technology can support you, but machines cannot decide for you. Data is historical. You need to look forward and decide who your customers are and what they want to buy. Shen: What prospective investments are you looking at right now? Chen: The first is channel platforms, both online and offline. We want to be heavily involved in this industry. The second is the brand itself. Brand equity is very important in the fashion world. For example, beauty products have very high mark-ups. But people still buy, not for the function. You will never buy perfume because it’s functional. So, brand equity is very important. The third is technology, including supply chain, AI, big data and so on. Our goal is to make businesses running more efficient, leveraging on technology. The last part for investment or venture is about people. That’s the key part and the most important thing. The team is always the priority.